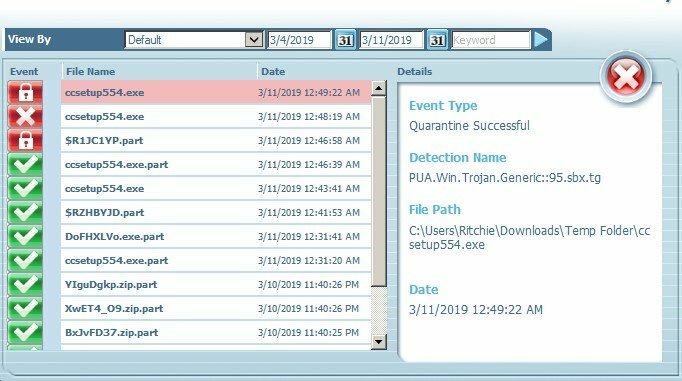 Immunet is quarantining CCleaner's newest 5.54 installer package with this PUA.Win.Trojan.Generic::95.sbx.tg quarantine response (see image). I tried to restore the installer but that doesn't work. At first I couldn't even download it but I managed to get the installer downloaded using the restore feature but as soon as you click on the installer to start the installation you get yet another quarantine and the installer package disappears. Tried again to download the installer after restoring the installer package, got it downloaded that way only to get another quarantine while trying to install & the package disappears even though I restored those files last time to no avail. No matter the the amount of restoration you CAN NOT get this to install not to mention the hassle just to get the installer to download. Thanks Richie, I've passed this on to the clam team for a fix. Thanks for looking into this Rob! Actually forum member Aris deserves the credit for reporting this first. Could you let us know when it's fixed since it's been a while since I updated CCleaner and would like to install this new build myself. Yup, got the installer to download with no problems & got 'er successfully installed! Piriform already issued a new build. What I got with the installer was version 5.55.7108. Mmm, usually a software vendor doesn't release a new build that quick unless it's some sort of priority bug fix. Makes me wonder if Immunet was but just one in a list of AV products that had problems with that installer.